Judith A. Cooper “Judy”, 68, of Olathe, KS passed Mon. Jan. 30, 2017. Visitation will be 1 PM Fri. Feb. 3 at College Church of the Nazarene, Garrett Chapel, funeral will follow at 2PM. Burial will be at Olathe Memorial Cemetery. Judy was born Nov. 11, 1948 in St. Louis, MO to Marvin “Bo” and Wanda Rinehart. 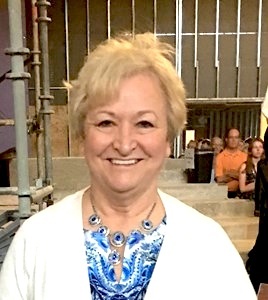 She attended Mid America Nazarene College and was a member of the pioneer class in 1968. She received her degree in education at Bethany Nazarene College. Her first teaching assignment was on the Navajo Indian Reservation in Northwest New Mexico. She taught 5th grade in Edgerton, KS for 12 years before moving to Olathe in 1987. Where she taught 5th grade for 19 more years before retiring in 2005. She was passionate about teaching and truly enjoyed her students. After her retirement, she and Rick purchased a business in Ouray, CO and operated it for 8 years together. One of her biggest challenges was that she overcame breast cancer in 2013. She married Rick Cooper June 30, 1984 in Ferguson, MO. She was a proud wife, teacher, aunt, sister and daughter, who loved to spend time with her family and friends. She was a devote Christian attending services at Church of the Resurrection and College Church of the Nazarene. She was preceded in death by her father Marvin “Bo” Rinehart and her brother Rick Rinehart. She is survived by her husband of 32 years Richard “Rick” Cooper, her mother Wanda Rinehart and 8 brothers and sisters; Bob Rinehart, Ron Rinehart, Nancy Colbert (Tom), Linda Brinkmeyer (Kevin), Janet Rinehart, Penny Dummitt, Pam Moran and Dan Rinehart (June) and many nieces and nephews. In lieu of flowers, donations can be made to the American Cancer Society.